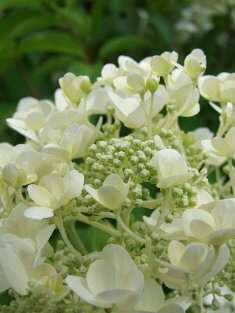 Joy Creek Photo Archive (c) all rights reserved Hydrangea paniculata 'White Moth' has foot-long panicles of extra large white flowers. The panicles are 9 inches wide at their widest. Two-year old plants flower over our heads. Early autumn. 10 ft. x 8 ft.